Thomas E. ‘Tom’ Schotz, age 75, passed away peacefully in the afternoon on Saturday, January 26, 2019 surrounded by his loving wife Rose Ann and family. Tom was a lifelong resident of Merrill. He was born on March 26, 1943 to Charles and Gertrude (Allen) Schotz. Tom was a graduate of St. Francis Xavier Catholic School and Merrill Senior High school where he lettered in football and track. Tom met the love of his life, Rose Ann J. Middlestead in high school and they were married on July 6, 1963. They celebrated their 55th wedding anniversary this past summer. Tom and Rose have three daughters, Laura (Patrick) Duginski, Victoria (Douglas) Berndt, and Lisa (Scott) Theese. After graduation Tom joined the Wisconsin Army National Guard and later served in the Army. He was in the 632nd Armored Division and was a Tank Commander. He was honorable discharged with the rank of Sergeant in July of 1967. He fondly said it was the best job in the world. 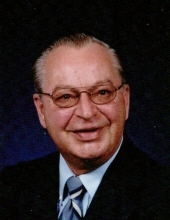 Tom was employed at Semling & Menke until 1968. In April of 1968 he joined the Merrill Police Department as a Patrolman. In July 1976 Tom was recognized as Outstanding Young Officer by the Merrill Jaycee’s. He went on to become Merrill’s first Detective, and later the first Inspector. During his police career he also taught drug classes at the high school. Tom retired from the police department in 1996. Not one to sit idle, Tom ran for Alderman in 1998. He served as Alderman from April 1998 until April 2004. His combined service to the city of Merrill totaled 34 years. Always a part of the community, Tom served as PTA president at Franklin School, and was a Governor at the Merrill Moose Lodge. Tom was a life member of St. Francis Xavier Catholic Church. He taught CCD classes at church, and enjoyed working at the church’s summer carnivals with his wife. Tom enjoyed hunting, fishing, and woodworking. Some of his best memories were of deer hunting with his brother Herb at his cabin. He taught his daughters how to fish and spent many hours putting on worms and taking off the catch of the day. Christmas gifts were made in Tom’s basement wood shop and are treasured to this day. He loved traveling with Rose to such places as Hawaii, New York, Tennessee, Michigan, and South Dakota. Tom is survived by his wife, Rose Ann Schotz, Merrill; daughters, Vicky Berndt, Merrill, and Lisa Theese, Cumberland, Wisconsin; six grandchildren; one great grandson; two sisters, Margaret (Jim) McClellan, Missouri, and Jean Schotz, Wisconsin; four brothers, Herbert (Louise) Schotz, Irma, Phillip Schotz, Wisconsin, John (Kathy) Schotz, Merrill, and Richard Schotz, Wisconsin; and many nieces and nephews. Besides his parents, Tom is preceded in death by his daughter, Laura; one sister; and four brothers. The Mass of Christian Burial will be celebrated at 12 Noon Friday, February 1, 2019 at St. Francis Xavier Catholic Church, Merrill. Father Chris Kemp will be the celebrant. Burial will follow in St. Francis Xavier Catholic Cemetery, Merrill. Visitation will be from 4:00 PM until 7:00 PM Thursday at Taylor-Stine Funeral Home. Online condolences may be made at www.taylorstinefuneralhome.com. To send flowers or a remembrance gift to the family of Thomas 'Tom' Schotz, please visit our Tribute Store. "Email Address" would like to share the life celebration of Thomas 'Tom' Schotz. Click on the "link" to go to share a favorite memory or leave a condolence message for the family.